Hot Glue Gun Helpers are life savers. I can't recommend them enough! Disclosure: I included affiliate links in this post for your convenience. Thank you for supporting Condo Blues! 1. 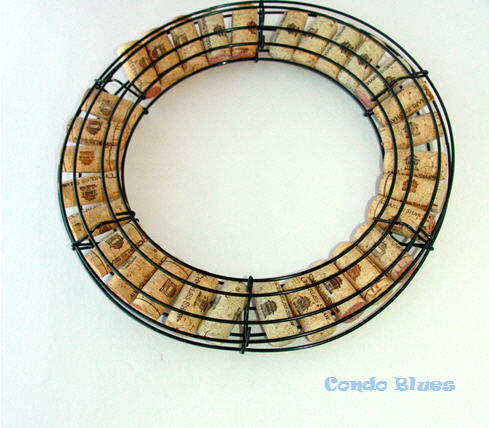 Place 5 wine corks per section in one of the metal wreath forms bottom facing up. 2. 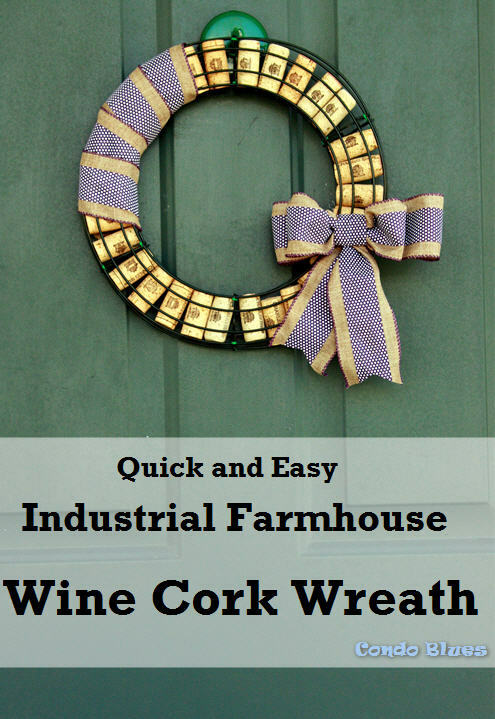 Put the second wreath form top side facing up on top of the first wreath form to make a wine cork and wreath form sandwich. Any guesses what my go to brand of wine is for mulling and making sangria? 3. Cut 12 lengths of florist wire with the wire cutters. 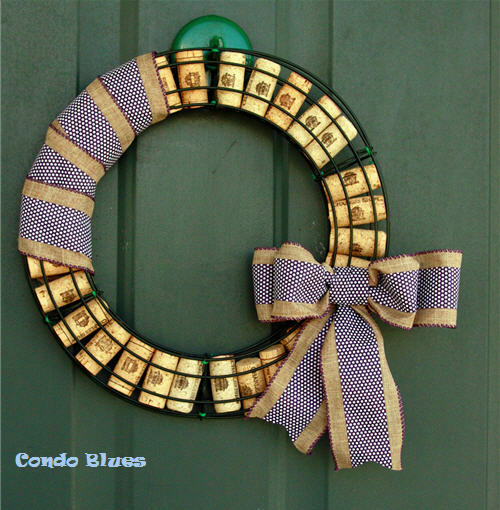 Use the wire to twist and attach the top and bottom wreath forms together at the metal horizontal wreath form supports. 4. 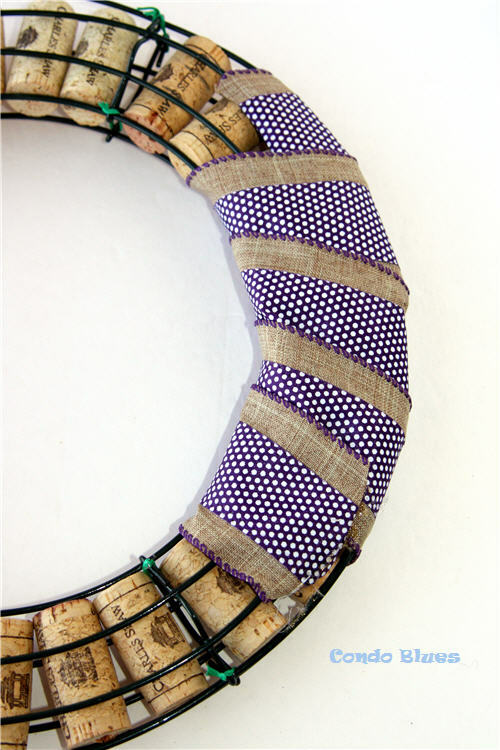 Turn the wine corks in the same direction if desired. 5. Wrap a cut length of wired ribbon around the wreath from four times and hot glue the ribbon in place. Put the smaller ribbon loop on top of the larger ribbon loop. Pinch the center of the ribbon loops with your fingers and tie it into place with a length of florist wire. Hot glue a small strip of ribbon around the center of the bow to hide the florist wire. 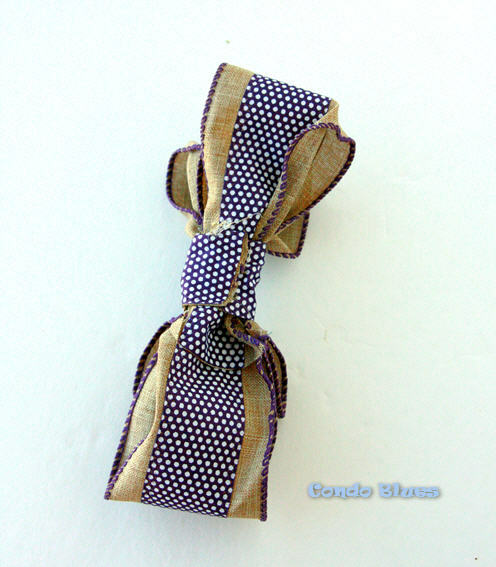 Make the ribbon tails by cutting a length of ribbon, folding it in half, and hot gluing it to the back of the bow. 6. Use the hot glue gun to hot the bow to the wreath. 7. Twist a loop of ribbon to the back of the wreath to make a hanging loop, hang it up, and look cute! I want to say I only drink wine to decorate with the corks but really I think wine and good company go together like wine and good company.